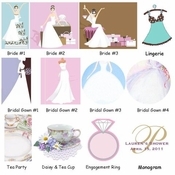 Bridal Shower Favors should not be stressful! Our Caramel Corn Favors fit the bill! 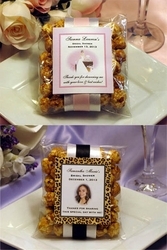 Each Bridal Shower favor comes with 1 cup of fresh, irresistible caramel corn placed in a crystal clear resealable pouch. Then we dress them up with two layers of satin ribbon, and finish them off with a cardstock favor tag personalized with bride's name and shower date. Available in Leopard border (as shown), Zebra border, or solid color border. Comes fully assembled as shown and measures approximately 4 inches wide by 5 inches high. A delicious reminder of your special day.